I had heard about Lisa Becker’s book Click: An Online Love Story and knew instantly that I had to add it to my Book Review list. A few weeks later, I received an email from Lisa asking me to review her book. I was even more excited to start her book, so I moved it up on my list, (I’ll have the review up within the next two weeks). After reading up on this very talented author from other bloggers and reviewers, I wanted to have her for my next Guest Author interview. 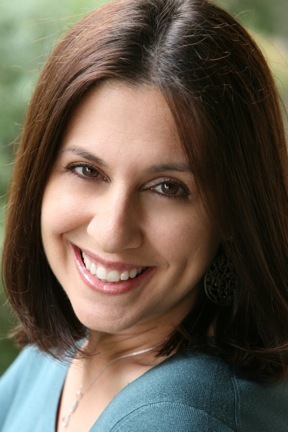 Not only is Lisa Becker true to her Chick Lit genre, but she’s also someone who I admire. When did you start writing? I remember writing short stories and poems as a little girl and dabbled a bit in high school. But, Click: An Online Love Story is my first real attempt at a work of fiction. What motivates you? Fear of public ridicule. Seriously, I wanted to write something light and fun that people like me could relate to. I spent a lot of time trying to capture the humor we all need to have and find in life and love. Why did you choose to write within your genre? My husband and I met online on a popular dating website. After we married, I was recalling some of the hilarious experiences that I had with both traditional and online dating. I decided to capture some of them in writing and from there, a “chick lit” novel emerged. Are you working on any projects right now? I’m a full time mom and wife to the best family ever; part time public relations professional for an international PR firm; part time professor of public relations courses at a state university in California; and I’m bringing to market a children’s education product that I’ve invented. Somehow in between this all, I managed to write a book. And, due to popular demand, I’ve started drafting notes for a sequel, currently titled Double Click. I’d love to incorporate reader feedback, so I’m hoping people will stop by the book’s Facebook fan page and tell me what they’d like to see happen next. Needless to say, there’s never a dull moment around here. How would you spend your perfect day? I get to sleep in…until 8:30. (With two small kids around, that would be no small feat.) The rest of the day would be spent with family and friends, food and wine, laughter and great conversation. Essentially, that’s all I really need or want. Oh, and fielding a call from Oprah’s Book Club editor. That would be really nice too. What is your advice for a beginning writer? Much like the other author advice that I’ve read before, I would say to: (1) write what you know; and (2) make a commitment to write every day. Do you have a writing routine? If so, what is it? I started writing the book after my husband and I married but before we had kids. Then I had to take a break from writing due to the rigors of motherhood. But I had always told myself – even as a little girl – that I would write a book one day. So, I made the commitment to finish the book. I wrote in the mornings while the girls were at school or at night after they went to sleep. I made it a goal to write – even if only for a half hour – every day. As a writer, what do you think is/are your greatest strength(s)? I think what comes across best in this particular work is a realistic and conversational tone coupled with a format that make people feel as though they’re talking with their best friends. Is there a message in “Click: An Online Love Story” that you want your readers to grasp? I’ve said many times before, if it happened for me, there’s hope for you. And, as my grandmother used to say, for every chair, there’s a tush. Love is out there; just be patient. And concentrate on being a complete, happy and fulfilled person on your own. When you are happy and secure in your own life, you will be much more attractive to someone else. What tool(s) do you think are must-haves for writers? A successful writer needs the following: creativity, time to write, a great editor and a willingness to alter what you’ve written to make your story stronger, better and clearer. I’m reminded of some advice I was once given. I had interviewed Charles Rosen, one of the producers of the original Beverly Hills 90210, for an alumni magazine article while I was in graduate school. And I’ll never forget what he told me, “Don’t fall in love with your words, because somebody above will probably change them.” A successful writer understands this and embraces it. Once you finished writing your book, how long did it take before it was published? Click is a self-published novel. I explored the traditional publishing route and got feedback from multiple literary agents. One in particular explained the current economic state of the publishing industry to me. Due to the large investment to edit, produce, distribute and market a work by an unknown author, many large publishers won’t take the risk. Self-publishing is a way to get your work out there. So, once I decided to self publish, it was a matter of only a few months before my book went from finished manuscript to published work. Congrats, Lisa on your book and being brave enough to do it on your own. I hope the time genie grants you more time in your schedule. Sounds like you could use it. Take care and all the best with your new projects.